Need to move a hot tub? If you have a hot tub, make sure to tell your moving company about it. Hot tubs can be a hefty “hidden cost”. If you don’t have a moving company, then get ready to do the heavy lifting yourself. Well, yourself and two others, and the following: a dolly, two 2x4s, some rope/bungee cords. 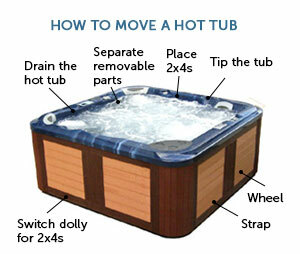 Because of their weight, size, and price-tag, hot tubs are one of the more difficult things to move. However, if you have some helping hands (preferably 3-4 people, though it’s possible with 2), then you can handle it quite easily. Separate removable parts – like the heater, pumps and plugs. Wrap and box the more fragile parts. Place 2x4s – put them parallel to each other just next to the hot tup. Space them just lest than the height of the hot tub. So, if the hot tub is 3 ft, space the 2x4s about 2.5 ft apart. Tip the tub – put it on its side so that its side is resting on the 2x4s. Switch dolly for 2x4s – either slide the dolly under the 2x4s (if possible), or slide the hot tub off the 2x4s onto the dolly. Strap – tie the hot tub to the dolly. Wheel – carefully wheel the dolly to where you need to go. If you need to get the hot tub into a moving truck, make sure there is a ramp available.